I'm on the organising team and we've listened to feedback from last year's survey where many players told us how unwelcome Britcon's two late night games can sometimes be, and so for 2013 there will be an option to drop Friday or Saturday night's game and just play 5 games in the larger gaming periods. This also means that each of the "traditional" 6-game main periods will now be decided by counting player's best 5 scores over the weekend. Prices Frozen - we know there is a recession out there, so through careful negotiation with the venue there will be no increase in entry fees in 2013. Accommodation still optional - we've also negotiated some great rates at UMIST for a variety of standards of rooms, starting as low as £33.50 for Bed and Breakfast - all still in stumbling distance of the venue and bar as usual. Not sure if this is of interest to anyone other than me, but just as an experiment here are some extracts from the Google Analytics traffic reports for this website over the past month (7th Jan-6th Feb). Where is everybody from? Well, UK, USA and then Australia... Italy and NZ get in there too. All classic Wargaming countries..
What's the first page everyone lands on? The main front page (index.php) is not so closely followed by the FoGAM wiki - probably because the Wiki picks up a lot of hits from Google searches, as will the Ambush Alley and 15mm Ancients supplier listing pages. The two match reports have both had direct links posted on various forums over the past month, hence their high placing in this month's figures. The "Bounce rate" in the last column indicates times when only one page is clicked before the visitor leaves the site. This stat always hovers around 40% or more, which isn't actually that bad for a content site apparently, and there are various technical Google-related reasons why it is at this level - google it if you are that interested! 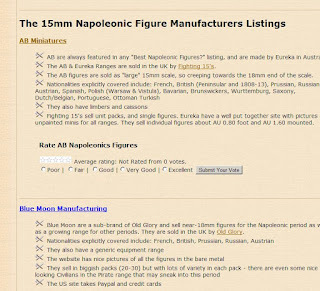 These are the most popular pages over the past month - no surprise that the front page (index.php) is - as usual - top of the list, but the 15mm Ancient, 15mm Renaissance and Modern 20mm Suppliers indexes all rank very highly (take note if your are a manufacturer! ), and the AM Wiki is still incredibly popular too. The FoG Index is a bit of a hangover from before the Wiki was set up, but it generates a lot of traffic from Google searches so I have left it on the site as a sort of gateway that appears to be easy to find. The Godendag match report hasn't yet had enough time to make it into the top 10, but the earlier report from Oxford has been there for three weeks so is at No.6 in this ranking, and near the bottom is one of the many pages to list eBay auctions - which is great, as eBay pays me a small commission for any sales that get made after people click through to eBay from something they see on this site. This shows screen resolution - again some stats about mobile devices creep in at the end. Finally, this shows sites that provide a direct link to Madaxeman.com. The two variants of the Blogger site are both the Madaxeman.com Blogger page - which looks exactly like the main site but is in the Blogger network, which many people use for their Wargaming news. TMP and Slitherine are the two big traffic sources - again mostly from match reports and other content I post up there, but occasionally when someone else posts a link to Madaxeman.com without me suggesting it (which is really great - when it happens!). Not sure if this is interesting or not really, but feel free to leave a comment on either the Madaxeman.com Facebook page, or the Blogger site to ask any questions or suggest anything I'm missing. After only 2 weeks it's four more match reports ! See how Louis' boys take on the Austrians, Swedes, Ottomans and Anglo-Dutch in 4 epic battles with some of the wildest swings of fortune ever recorded on this site !